The Coach and Horses offers traditional country B&B in our recently converted stables - providing comfortable bed and breakfast accommodation. Whether you just need a bed with breakfast for a single overnight stay, or if you are looking for a B&B in Northampton for a longer stay, then The Coach and Horses, located in the lovely village of Brixworth (approx 10 miles north of Northampton, Northants), is the place to stay. This Northamptonshire Bed and Breakfast is only a stone's-throw away from the Althorp House estate, Lamport Hall, Boughton House, Cottesbrooke Hall & Gardens and Stanford Hall, not to mention the local Brixworth Saxon church dating from around AD 680. 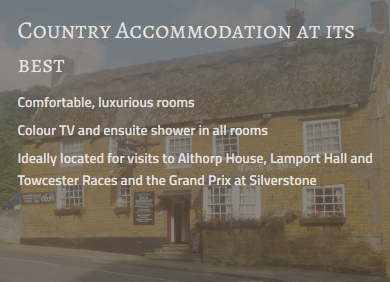 Our B&B in Northampton is also ideally situated for somewhere to stay near Silverstone Race track. Our newly converted stableyard B&B accommodation offers bedrooms with single beds, twin beds, or double beds and is ideal for individuals or couples looking for a bed and breakfast to stay in near Northampton. If you are looking for a bed and breakfast to stay in whilst travelling up and down the country, or need accommodation whilst travelling from one side to the other, the Coach and Horses near Northampton is a great place to stay. Our Northamptonshire country B&B is only about 10 mins from Junction 2 of the A14, just along from the M1/M6 junction. You can get out of bed and, after a hearty breakfast, if you're feeling energetic, Pitsford Reservoir with its beautiful country walks and cycle hire facilities is five minutes down the road. Or, for a more leisurely day, you could visit the old Saxon Church in the village of Brixworth itself. The former Northampton to Market Harborough railway line offers an ideal day's walk and our accommodation is just up the road from the Northampton & Lamport Railway, which still has trains running at certain times of the year.